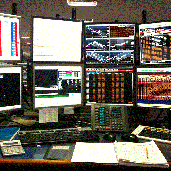 About me Began on the LIFFE trading floor in 1987, two weeks before the October '87 crash. Helped launch Spreadex in 2000. Ex Head of Trading at MF Global Spreads, the profile pic is my very desk. Have had my analysis quoted by Bloomberg TV, CNBC and Reuters.